Our life’s journey to discover happiness is a solo adventure (happiness comes from within) and no one other than you can make it happen for you. expecting anything from others is unreasonable. We can hope, but we can never expect! Hope and expectations are completely different constructs (concepts)! Hope is something we create internally and through our desires we project out into to the world – hope depends only on us: our dreams, our goals, and our thoughts. We hope for an outcome, we hope for things to happen, and we hope to feel a certain way when “it” happens. Hope springs eternal and does not need others to be involved in our journey. Expectations are a completely different thing because by their nature others are intimately (and often unsuspectingly) involved every step of the way. While they are also created internally, expectations are immediately infused with judgment and criticality based on “what would we do.” Expectations are like writing a screenplay for others and chiding those who don’t play their role the way you’ve intended. “Unfulfilled” expectations create detours and unnecessary delays on our road to happiness. When you hang on to hope and let go of your expectations, life becomes easy! Practice letting go of your expectations of others and replace them with hope. 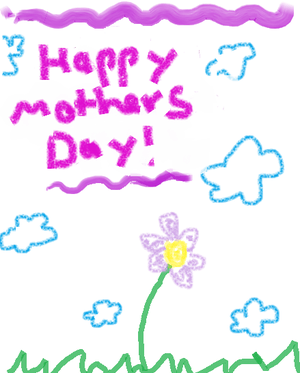 Happy Mother’s Day – be a Mother to Yourself! It might sound a bit circular to you to suggest that you be a mother to yourself – but I believe that most mothers (no matter how wonderful) fall short of being the nurturing, caring, unconditionally caring mother we all need to get us through life. Moreover, the perfect mother would remind us that we are good enough, beautiful enough, smart enough, deserve love, and can make it no matter what or who life throws at us. But, like a Barbie doll – such an ideal is only a fantasy. My mother did her best to raise five children (only seven years apart) and offer a nurturing environment – given her knowledge and parenting skills, and I am truly grateful. I always had a home where I knew someone would know my name and I could fall asleep without fear of violence or hunger – I am grateful, especially when I know that not everyone had this luxury. Regardless of what your mother was like, I believe that EVERY mother falls short of being the ideal mother we need(ed). The good news is that no matter who was/is your mother, we all have the opportunity, starting today, to be the ideal mother to ourselves. We can give ourselves the inner pride, security, safety, unconditional love, acceptance, and truth to become the best we can be! Many books attempt to teach us how to nurture ourselves and overcome our childhood – including as the Inner Child, I’m Ok- You’re Ok, There is Nothing Wrong with You, Co-dependent No More, The Four Agreements, etc. ; but few teach how to be the mother you need(ed) for yourself. Being able to rely on unconditional love and undying support of the ideal mother can only come from within. We owe it to our inner child to give him/her the nurturing in the way we need, from someone who knows us better than anyone possibly can. ...you are extraodinary…you are beautiful…and you are loved. In The Four Agreements, author don Miguel Ruiz says that Agreement #1 is Always live with integrity. In other words, never tell yourself anything that you would not tell a best friend. Be supportive, loving, accepting, proud, nurturing, and giving to yourself! The second step is to write down the characteristics an ideal mother (or father) would have (or could have) provided in your life, and then start doing them for yourself! Does this make Mother’s Day sense? Does this ring true for you (or anyone you might know)… please comment! Do you ever feel like you’ve wasted heartbeats living your life based on what others tell you is true (using guilt, conditional love, coercion, religion, shame, and downright lies) instead of creating the life you want? I don’t know about your story, but I am slowly realizing that the “fill in the blank” projections of what others told me I need to be (you should be more – fill in the blank; you are way too – fill in the blank; what will other people think of you because of – fill in the blank) are so distorted as to be laughable. And none of them are true! I must be a slow learner, but only recently did I wake up to see that people from my past would build themselves up by putting me down. My psyche suffered years of anguish and guilt because I believed the distortions I saw through broken glass. The perps got to feel superior, earned big financial wins, and were largely successful in squelching my spirit. After a lifetime of words and insistence that I will never be good enough (for the world), I realize that this is simply not true. Moreover, I am discovering that I never needed “glasses” to see the world properly in the first place – my perceptive vision is (and was) 20/20. My heart sees (and feels) that the positive words are true, but hearing positive words (with insistence) is so rare that I had to have them repeat them. Even now, it takes an effort to overcome the negative reflections from the past and accept that the love I’ve known was conditional to me being someone I am not. Today, I love myself (I know that I am loveable) and that is all that matters. I see the world as I see it and the Royal We (me, myself and I) are happy. One would think that it should be easy to bury the broken glasses today. Unfortunately, people from my past try to prevent me from doing so. Family members insist that I am doomed to eternal damnation because I don’t adhere to their religious edicts (not my truth). The narcissist continues to contacts my friends to be his friend (and they call me to say “WTF is his problem!”) Others continue to try to get me back (to benefit them) years after I stopped the relationships. I guess that’s the nature of controlling, broken glass relationships – a controller needs someone to control. Living in integrity (treating myself the way that I treat my best friends) is my truth. My intuition celebrates that I trust that my perceptions are true (undistorted) and believe that I deserve love. I am at peace with who I am (and who my friends know). This makes for a satisfying life of self-love, mutual friendship, and trust in oneself. It’s finally nice to know that my vision was 20/20 all along. Thoughts become words become actions become… destiny? Read the post and let me know what you think – can we alter our present and our future through the power of (positive!) words? There are two types of people in the world – those who say “no” and those who say “yes” as a matter of upbringing, personality, habit, or need for acceptance. Stereotypically, the people who say “yes” are women who were raised to go with the flow, be service-oriented, don’t rock the boat, and the best one – take care of others before you take care of yourself. Many of us learned and believed that the latter was our lot in life playing a support role to the world. One of the most powerful self-care words in the English language is the word “no” (even when your first inclination is to still say “yes”) because it allows one the space to consider our own wants and needs first (which is the way it always should have been) before accepting the needs of another to override. Much of my adult life has been spent saying yes: yes to children, yes to a spouse, yes to volunteer roles, yes to school, yes to friends, yes to everyone – and, no to myself. Finally, having read enough survival guides, I realize that “no” is a critical survival technique that should be taught to girls (especially!) and boys everywhere – we only have one life and one person (me) who will take the care to make sure our needs are actually met. Everyone else wants to make sure their needs are met first! When you read the outlined paragraph, it falls along the lines of how I believe that my generation (end of the boomers) in North Americans are raised: boys were raised to take care of themselves, and girls were raised to take care of – well – everyone (except themselves). Why is there gender inequality? Who knows? But the best way forward is for everyone (regardless of gender) to take care of their own needs first (see Put on your Own Mask first) so that NO is an option, and not rotely saying YES and regretting it. I “no” you’ll find a way to have a good week! Are Women the Worst (Workplace) Bullies? The topic of bullies is front and center these days thanks to the philanthropic efforts of Lady Gaga and Oprah at Harvard, the recent release of the documentary “Bully“, and a rise of suicides linked to cyber-bullying. But bullying is not confined to schools – in fact, workplace bullying traditionally has been categorized and addressed as sexual harassment, if at all. Adult bullying can take many forms such as narcissistic bosses (see my post: Walking on Eggshells – Source of Back Pain? ), harassment, group think (pressure to conform to the wishes of the group), and biases against minorities/gender/age, etc. The article in Forbes cites a much more insidious, everyday situation of workplace bullying where women don’t just usurp other women, but can even create hazards and obstacles for others. Stereotypically, it has not been the same situation with women who are on par or above my level – and that has been a source of confusion and at times, “shock and awe”. In some professional (and more often in personal) situations, same aged women, on the surface, have welcomed me with open arms offering their friendship and help, then reached behind to stab me in the back, and in the process they never stopped smiling. Sometimes it’s no wonder that men do not understand – I do not understand and I’m a woman! It is a strange thing… granted, men and women everywhere will step on and use others to get ahead (is it human nature or nurture?) – but the behavior is different. Men will more often attack head on, directly and consistently; there is no question about their intentions or offensive behavior. Predictable, consistent, stab you in the chest. I can accept that and take action to avoid the pain. The question: “Why are females mean to other females?” is today either avoided or hotly debated, but the fact remains that the situation won’t simply go away by marginalizing it as “Catty behavior” or ignoring it all together. As women, we have enough to deal with in life being parents, co-workers, survivors of the economy, caregivers, neighbors, significant others, and just plain noble citizens without having to watch out for other women gunning to get us! In the words of Rodney King (the focus of the LA Riots 20 years ago) – Can’t we just get along? Finding a good team of like-minded people! I am fortunate to now be a part of a wonderful team at QSM, Inc. with confident, powerful, assertive women who are not intimidated or jealous of other professional women. Our multi-disciplinary, gender balanced team is forward thinking and definitely supportive of each other. I am blessed to say I’m on the same team with several high-powered, direct, accomplished, and supportive women – it is a dream come true! I believe that women need to learn to start supporting other women, and we need to stop stereotyping men as the culprits to the bullying phenomenon. It reminds me of the situation regarding minority cultures who point to other cultures and races as the source of their problems (that they cannot solve), when the answers realistically lie with working within their own community to create solutions. As popular self-help gurus point out, when you point a finger at another, there are four fingers pointing straight back at you! As women and mothers, I believe that we need to start a movement (even a movement of one!) that nurtures, boosts, and supports other women – at home, work, and everywhere. Such a movement of women (and supportive men) would take our country and our workplaces into a brighter future! Rarely do we find men who willingly engage in hard, solid thinking. There is an almost universal quest for easy answers and half-baked solutions. Nothing pains some people more than having to think. –Martin Luther King, Jr.
Wow! Incredibly powerful words from decades ago – yet they have never been more true than today! Whether in business or in personal affairs, no one seems to value hard work, persistence, or thinking these days. Relationships are disposable, communication is impersonal (with text-message soundbites), governments look for the quick fix, corporations value capitalism over people, and shortcuts are the norm rather than the exception. I don’t know about you, but my email inbox seems to attract an ever-increasing barrage of spam – most offering “get rich while you sleep” schemes – and it makes me wonder who is actually working while all of these salesmen are busy promoting. At tax time (April 15), the Tampa Bay Times featured a front page article showing the latest scam where scammers submit fraudulent tax returns (using social security numbers of dead people) to “earning” an average of $9000. per return. None of the offenders feared the IRS and they were proud of their endeavors. Sheesh, what is our society coming to when someone’s 15 minutes of fame comes at a heavy expense to all of us? Several months ago, the same paper profiled citizens among us vacationing on proceeds their insurance company paid out for sink hole claims for repairs never made. Both stories highlighted the shortcuts that cost taxpayers millions. Yet there are millions of other smaller shortcuts to fame and fortune and half-baked scams happening everyday all around us. Why do we accept (and settle for) short cuts and half-baked solutions in life today? The first step to realization is to look at our behavior (before we look at others.) Why do we take shortcuts or live with half-baked solutions to what ails us? Probably because it is easier, less work, less stress, and comes with less risk of failure (and rework) to do the least possible. This allows us to save our energy for things that “really matter” later. As a result of not doing our best, we are dissatisfied with the results from ourselves or others. Moreover, when we do do our best, people may not appreciate it, so why bother to spend extra effort? When we look around, if everyone else takes shortcuts, why shouldn’t we? The answer is that, in the process, we shortchange ourselves, our children (who learn by example), and our community. We can see the results of our shortcuts and half-baked solutions everywhere: products don’t last like they used to; quality is down; expectations are down; product failures are up; and morale goes awry. In the banking crisis, banking professionals bet against their own customers to pursue profits, got away with it, and even got a bonus bailout for their efforts. No wonder our children seek shortcuts in everything they do. The Buck has to stop somewhere…why not with us? When we start to fully perform our work, invest in relationships (they take work), take time to do things right the first time (instead of half-baked), and insist on the same from others, our world (and morale) will improve. The America of yesteryear was filled with innovation, invention, progress, hope and dreams; hard work and integrity prevailed. I envision a future where I can look back and be proud that I put the effort in to “fully bake” solutions – at least for my life. How about you? Wishing you a success-filled week.